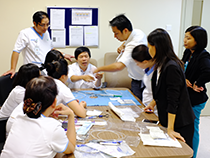 Due to the busy schedule of heathcare providers and constraint of equipment size, it is sometimes difficult to organise in-house training or seminar outside the hospitals. In Suntech, we have developed In-service training programs for all our products to cater for the users’ need. Please contact our sales representative to arrange for your In-service training.